Fig. 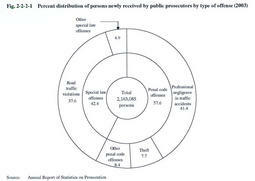 2-2-2-1 shows percent distribution of persons newly received by public prosecutors in2003by type of offense. In 2003,total persons newly received by public prosecutors were2,163,085,down by26,373from2002.Those received for penal code offenses were1,245,391(57.6%)and those for special law offenses were917,694(42.4%).Since1998,there has been a continuous increase of penal code offenses and decrease of special law offenses.In2003,persons received for penal code offenses increased by32,165,for special law offenses decreased by58,538from2002. Persons received for general penal code offenses increased by16,182from2002to349,504.There were significant increases for theft(by3.8%from2002),embezzlement(including misappropriation of lost property)(by12.7%),assault(by11.7%),and robbery(by9.2%).Those received for professional negligence in traffic accidents increased by15,983from2002to895,887. In addition,persons received for road traffic violations decreased by69,674from the previous year to812,538,but those for special law offenses excluding road traffic violation increased by11,136to105,156(see Appendix2-1 ).